The San Juan Island Sculpture Park is fun rain or shine! Love giving gifts, but feeling uninspired? Looking for something out of the box this year? This holiday shopping guide is for you. Treat yourself to a San Juan Island weekend getaway. Do all your holiday shopping in the adorable, completely walkable coastal town of Friday Harbor using below shopping guide. Book yourself a Massage as a reward. Return relaxed and bearing gifts, ready for the holidays! The thing with things is they are just things. The only source of knowledge is experience, says Albert Einstein. Why not give your kids unforgettable experiences this year, instead of more stuff. Experiences that will frame life for them and give them a sense of possibility. Every July and August the Friday Harbor Whale Museum puts on several slumber parties - Pod Nods - for kiddos between 6 and 11, for a fun-filled night with games, crafts, science projects, a movie and snacks for a whale of a good time! Take your kid on an epic whale watch tour with Maya’s Legacy Whale Watching to experience the astonishing wildlife and breathtaking beauty of the Salish Sea. See Orcas, Grey Whales and Humpbacks, sea lions, Bald Eagles and more, learn about the unique ecosystem of the Salish Sea, while having the time of your life. Maya’s offers wildlife tours year-round. Is your babe a budding artist? Gift her a Summer Saturday at the San Juan Islands Museum of Art and create something together under the knowledgeable tutelage of island artists. Is there even a guy who doesn’t like boats? 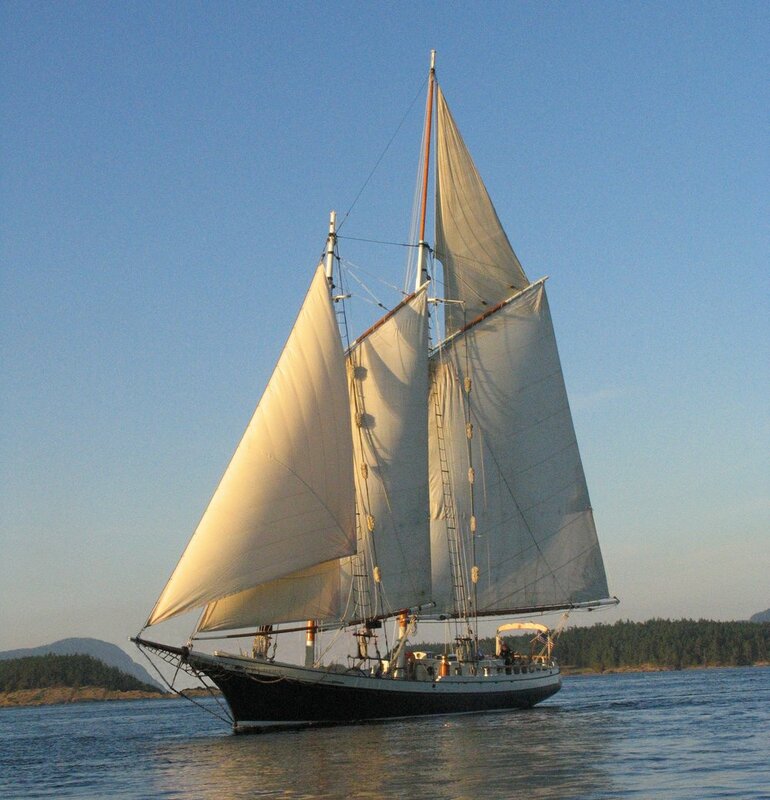 Give your serious sea man the gift of experiencing the islands from the deck of a classic, wooden sailboat. One with rich history, like the Spike Africa, which starred in “Joe versus the Volcano” and “Baywatch”. There is a boutique distillery on the isle, making award-winning vodka, gin, brandy, bitters and mixers, using island ingredients like the apples from their cider orchards, salal, madrone and rose peddles. They rarely distribute outside of San Juan Island, making them unique gifts. San Juan Golf & Tennis Club, home of the Celebrity Golf Classic, situated on stunning Griffin Bay with views of magnificent Mt Baker, features a beautifully manicured 9-hole golf course with alternating tee boxes that convert into a long and challenging 18-hole experience. Treat Dad to a round of Twilight Golf and a drink on the patio of the Greenside Grill. San Juan Golf is open year-round. Get a girl you love a weekend getaway at the Earthbox Inn & Spa, a retro motor inn with an indoor heated pool, sauna, hot tub and exercise room in the heart of Friday Harbor. Throw in a gift certificate for a spa treatment for good measure. Visiting the island is a rejuvenating and relaxing affair any time of the year. Acclaimed island artist Paula West makes handmade, functional ceramics, so beautiful, you might not want to gift them after all. Her studio is open to visitors most days – if the sign is out on the street, she’s open and ready to welcome you. Her graceful, whimsical pottery will lighten up your favorite woman’s kitchen and bring a smile to her face. The Pelindaba Lavender Farm on San Juan Island is not only a lovely place to visit, it also produces over 200 certified organic lavender products on site. Meander the Friday Harbor store, open year-round, for luscious lotions, massage oils, shampoos, soaps, bath salts and more, all hand-made and beautifully wrapped in handmade gift boxes. 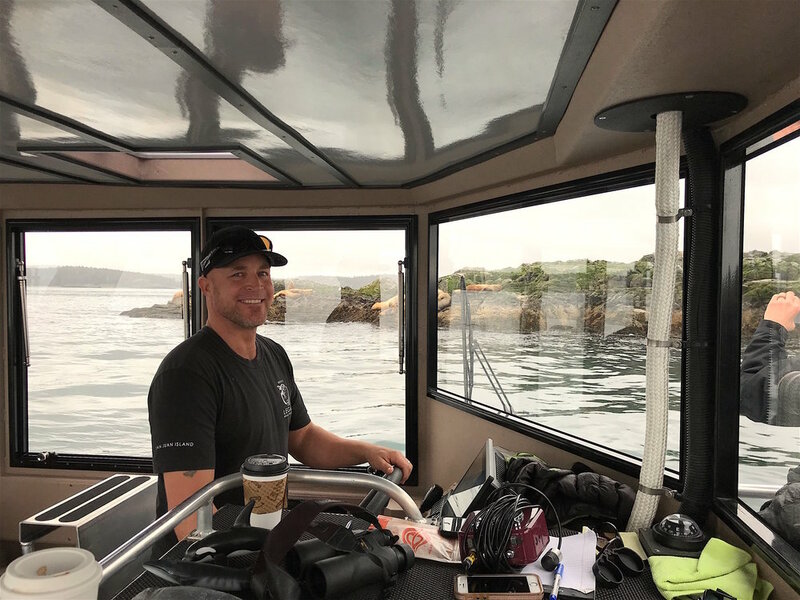 Respectfully observing wildlife while silently gliding through the crystal clear waters of the Salish Sea is one of the most profound experiences of a lifetime. Send your nature lover on a guided kayak tour with San Juan Outfitters to watch seabirds, otters, Orcas and to find out why seagrass taste like coconut. The endangered Southern Resident Killer Whales, who call the San Juans their home, are in trouble and need our help. Noise and water pollution, as well as dwindling salmon runs diminished our local whale population to its lowest count since the 70ties. Give the orca lover in your family the gift of helping and adopt an Orca through the Friday Harbor Whale Museum. Browse the magnificent Arctic Raven Gallery for genuine native art, like wood carvings, sculpture, pottery and jewelry, made from seashells, bone, beach glass and wood. San Juan Island Sea Salt was founded by the local Ryan brothers, who as boys wanted to save money on Christmas presents and so made sea salt as gift--right on their parent’s kitchen stove. They have since refined their technique (quite a bit), added smoked salts, sea salt rubs, bath salts, honey and - the best of all worlds - salted honey caramels to their impressive line-up. Their salt is similar in consistency to fleur de sel (French for "flower of salt") and very high in mineral content. The local Pelindaba Lavender Farm teamed up with San Juan Coffee Co and created a to-die-for lavender coffee, which is shade grown on small family farms, without the use of harmful pesticides. Pair it with a box of organic, gourmet lavender chocolates and/or a bag of lavender cookies for a true gustatory delight. The cute destination winery San Juan Vineyard with its historic tasting room and gift shop, turn-of-the-century chapel and rolling fields of grapevines, makes for a lovely outing. Do a wine tasting and find what local grape juice would suit your wine lover the best. The San Juan Islands Sculpture park with over 150 national and international sculptures on 20 serene acres along pristine Westcott Bay is an art lover’s playground. Funny, impressive and thought provoking sculptures along with poems line five trails in a meadow around a lake and through the forest. There is the Starfish project for kids to make their own art and a Friendship Totem to carve your name in to feel connected in art to all humankind. End the outing with a fancy dinner at Mc Millens Dining Room in nearby Roche Harbor, to make your gift complete. Joe with Crisanti Glass right by the ferry landing makes stunning glass pendants and marbles as cremation art, as well as the most playful glass ocean critters, sea inspired pendants and bottle stoppers. Plus you can watch him make them. There are seven art galleries in Friday Harbor within easy walking distance of the ferry dock. Find that island painting, sculpture, wood carving, photograph or scrimshaw perfect for your art lover. Browse the Island Studios, representing over 200 island artist, or the Saturday Farmer’s Market for thoughtful, unique, island-made gifts and souvenirs.